At Sarah Hoyt’s site, J.M. Ney-Grimm wondered exactly how the ancients manufactured swords in the Bronze Age. Bronze is made by mixing a small part of tin with a larger portion of copper. The ancients didn’t have modern strip mines or deep underground mines. Nor did they have sophisticated machinery run by deisel engines. How did they get copper and tin out of the ground? 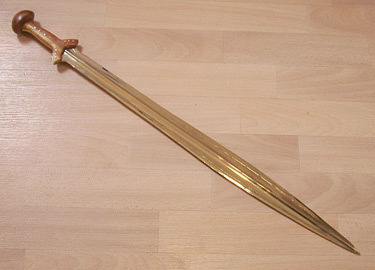 Were These Swords Any Good?If you compare a bronze sword to a steel sword, the steel is always going to win. But when the Bronze Age gave way to the Iron Age, bronze metallurgy was at its peak. Several thousand years had gone into the development of the most superb techniques. Iron metallurgy was in its infancy, and getting the iron swords to be rigid enough was a problem. The iron swords just weren’t as good as the bronze ones, which were light, strong, just rigid enough, and held an edge well. One Feedback on "Making Bronze Swords"